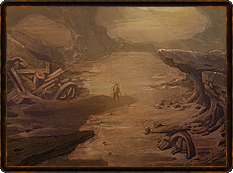 One might think it natural were I hesitant to venture into the wastes surrounding Caldeum. Those who have set foot upon the Borderlands’ burning yellow landscape and looked out upon its miles of barren sand roiling with terrible wildlife would surely agree with this sentiment. It was not always thus. In years past, I could have ventured forth with no concern for my safety. 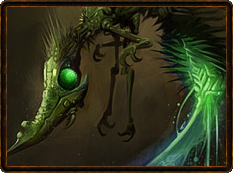 Though the Borderlands are among the most savage habitats in our world, even these deadly lands were no match for the superior resolve of Caldeum in its prime. The Borderlands were originally devoid of any but the most hardened (some would say crazed) prospectors until the great military city of Lut Bahadur (literally, “city of the gate”) was built to keep the lacuni in their cliff dwellings safely away from Caldeum. Lut Bahadur’s solitary watch over the desolate wastes came to an end four hundred years ago when precious ore was discovered in the region known as the Stinging Winds. The town of Alcarnus was quickly established as the centre of all mining in the area, with several other smaller settlements springing up in its wake. When the Dahlgur oasis was discovered and a third town was erected there, Caldeum’s dominance over the Borderlands was complete. 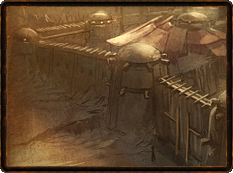 The Borderlands could reliably depend on fresh supplies of food and water from Dahlgur’s caravans, protected by the might of Caldeum’s Dune Guard.